NEW YORK – Under the theme “Make it Real” U.S. Senator Chuck Schumer, NYC Public Advocate Letitia James, City Council Speaker Melissa Mark-Viverito and NYC Mayor Bill de Blasio joined over 1,000 labor and community activists this past week in Manhattan to kick off a campaign to turnout the vote on the Working Families Party line. 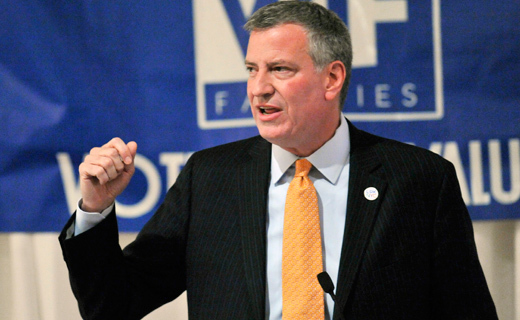 The WFP, a party representing a coalition of progressive Labor and Community organizations has become an increasingly important player in New York politics. After a number of legislative victories in New York City, including campaign finance reform, paid sick leave and the election last year of progressive Mayor de Blasio, the WFP faced criticism from some progressive circles after it endorsed Governor Andrew Cuomo over a possible independent run by academic Zephyr Teachout. Teachout lost to Cuomo in the Democratic primary but garnered an impressive 34 percent of the vote. The WFP endorsed Cuomo after he made a commitment to winning a Democratic/Working Families majority in the state Senate and a number of progressive legislative initiatives. The endorsement, opened the door for the development of a broad coalition of labor, community organizations and activists, statewide and local elected officials focused on winning control of the state Senate and a passage of a package of legislation including a statewide system of public financing of elections, a commitment to fix the school funding formula to invest more money in high-need schools, the DREAM Act, the Women’s Equality Act, decriminalization of marijuana, and raising the minimum wage to $10.10 while indexing it to inflation and allowing localities to raise it up to 30 percent higher than the state minimum wage. Speakers cited the need for a massive vote on the WFP line in order to win the state Senate, which has been controlled by a Republican minority in coalition with a breakaway group of Democrats known as the Independent Democratic Caucus (IDC), and ensure that progressive legislation, which has been sidelined over the past few years, is passed.